Why does the industry need GWO standards? Wind energy employers often carry out training that is generic, such as first aid or working at height. GWO members have standardized this training, achieving a wide range of measurable benefits. How do GWO standards work? The GWO framework aligns generic safety and technical training standards, common to all wind energy companies. 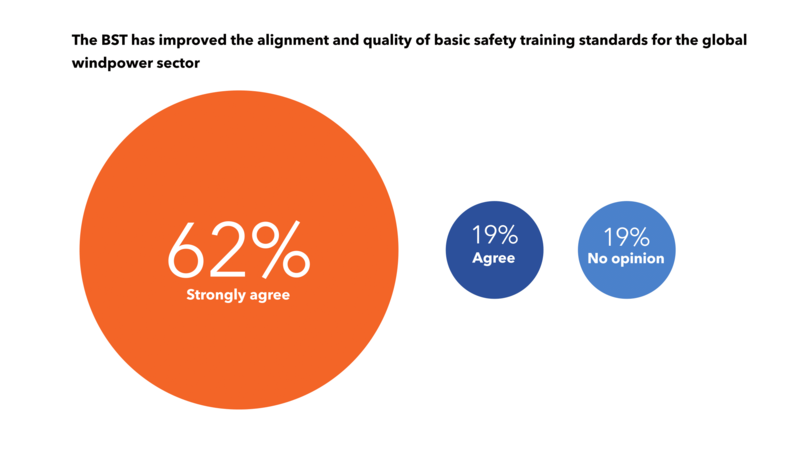 GWO members and independent service providers working within the GWO framework agree with the statement that GWO has improved the alignment and quality of basic safety training standards. Two thirds of GWO members have standardized over 30% of their entry level training programmes. As large employers responsible for tens of thousands of wind energy technicians' training, these companies have adopted training standards like the BST and BTT amounting to over two weeks’ instruction at entry-level and have standardized a considerable portion of their training. Having adopted the GWO framework, reduced duplication of training has improved productivity by allowing technicians to be available for work, in some cases by as much as 5-6 additional work days every year. Since 2012, companies have opened more than 270 available locations from which employers can purchase GWO standard training. Employers now have options to train technicians locally to their homes or close to their own operation. The GWO global training provider network is providing cost and efficiency gains, supported by the WINDA database infrastructure which allows employers to validate the skills of employees instantly using their WINDA ID. GWO standards are established as contractual pre-requisite in the wind energy supply chain, helping align the safety training activities of all contractors.